I learned recently during a trip through Scotland more about the Picts, who were a group of Late Iron Age and Early Medieval Celtic tribal people living in ancient eastern and northern part. Their language has been lost, except for fragments, although they left behind a wealth of “picture stones,” large monoliths carved with mysterious symbols whose meanings are mostly unknown. I encountered what their culture was like from the Pictish stones in Inverness. One of them showed a wolf, an important animal to them, as they were hunters which facinated me. I wanted to know more, thus I complied this article. The Ardross Wolf has been called the finest surviving animal symbol. The significance of the Pictish Wolf, or it’s meaning to the Picts is unknown. The assimilation of Pictish Culture into Gaelic Scot culture caused oral knowledge and the Pictish language to be lost, but the Wolf’s Gaelic names was Luh, Madadh Alluidh, and sometimes Mac Tire, meaning ‘earth’s son; The wolf lives still on in a number of Scottish place names though, such as Mullinavaddie (‘Mill of the wolf’) in Perthshire, as well as Lochmaddy, Ardmaddy and Craigmaddy. 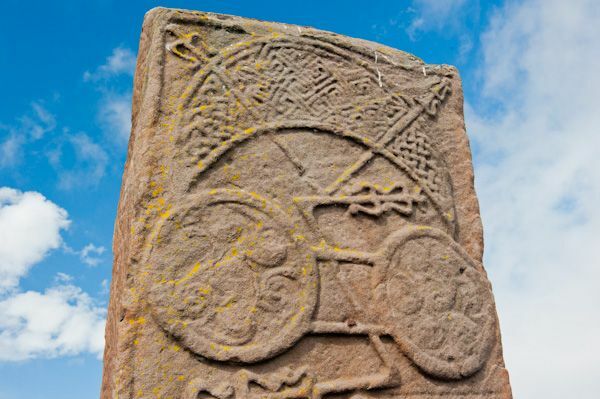 About 350 objects classified as Pictish stones have survived, with mysterious Pictish symbols, which have intrigued me, because those symbols live on when language of the was lost – the Archetypes of the Picts in Scotland endure. Picts are assumed to have been the descendants of the Caledonii and other tribes that were referred by Roman historians as Pictland, also called Pictavia. Whatever the case, by the end of the first century AD, there was an identifiable Pictish people occupying eastern Scotland above the Firth of Forth. In 84 AD, Agricola, the Roman Governor of Britain defeated a the Caledonians as, the Romans called the whole area Caledonia. The victory was transient at best: the following year, Agricola and his legions were recalled to Rome. The Romans abandoned their attempt to occupy the region and built Hadrian’s wall from Solway Firth to the mouth of the Tyne, and the Antonine wall further north, in an attempt to defend their southern territory. Near the end of the third century, Emperor Constantius invaded again still unsuccessful. From this time forward, Roman historians started referring to the northern people as Picts. Over the next hundred years, there were periodic raids across the wall driving the Romans back until they finally abandoned all of their outposts in Britain in 409. The Picts are mentioned unitil the 10th century, when they are thought to have merged with the Gaels. and by the 11th century the Pictish identity had been subsumed into the “Scots” amalgamation. The distinctive art work on stones and metalwork and later in manuscripts depict known things, while others are more mysterious geometric shapes, with distinctive curves. These stones are now thought to be associated with the territory of a family or clan. There are about fifty major Pictish picture-symbols. Some are easily identified as animals or mythical creatures; others are completely mysterious, such as the “crescent and V-rod” and the “double disk” emblems. They may have originated as tattoos or amulets. After the fifth century, most Picts converted to Christianity, and most of their carvings reflect this change; many of the so-called “Celtic crosses” dotting England and Scotland are in fact Pictish stones. Below, you can view some of the more common Pictish signs. Another object commonly inscribed on Pictish stones is the mirror, often paired with a comb. The comb and mirror are symbols of female wealth and prestige, and usually denote a woman’s memorial, although they are also heavily associated with mermaids. 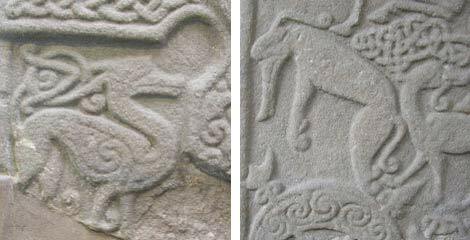 A powerful image, the Pictish Wolf was one of many animals the Picts carved on their stoneworks. The lines, deeply incised on the wolf, express the force instinctive to the nature of the most feared of dogs. 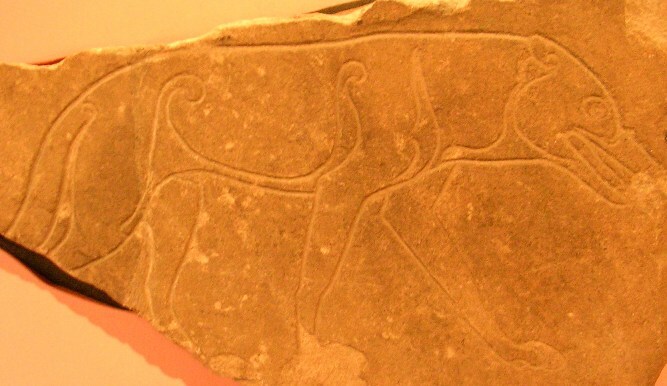 A fragmentary image of a wolf can be seen on the Ardross Stone, which is shown here upon, from the Inverness Museum and Art Gallery. which I visited. This is one of the most interesting and beautiful objects in the collections at Inverness Museum and Art Gallery. Made in the 6th or 7th century, the craftmanship is superb, a narrow line, expertly carved with a cleanly cut v-shaped profile. It shows a magnificent wolf which looks like it’s about to leap off the stone at any moment. The Pictish wolf stone was found in 1890 in a field dyke near to Ardross in Ross-shire. 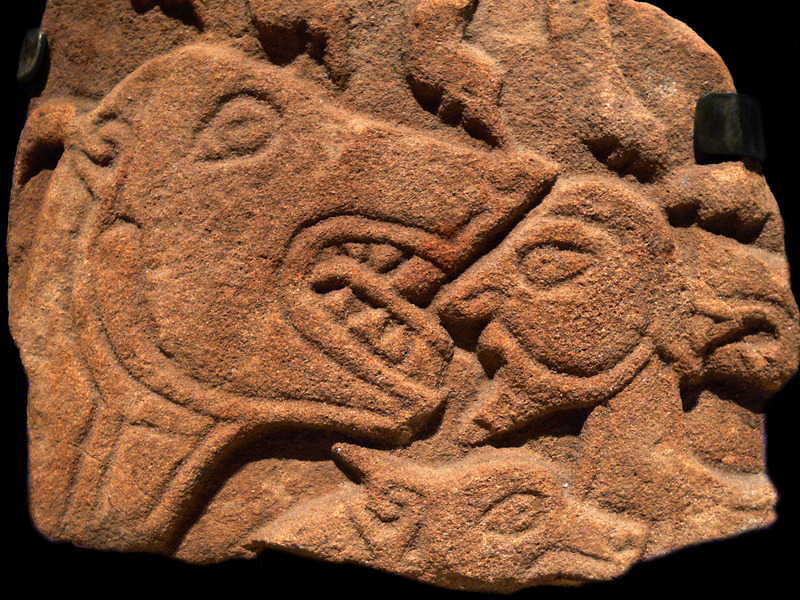 A Catalogue of the Pictish Symbol Stones at Inverness Museum & Art Gallery. Tags: Archetypes of the Picts. Bookmark the permalink. Previous post ← The cursed consultant. Dream.